The Clark School houses a wide range of laboratories and research facilities, including one of only three operating neutral buoyancy tanks in the United States. 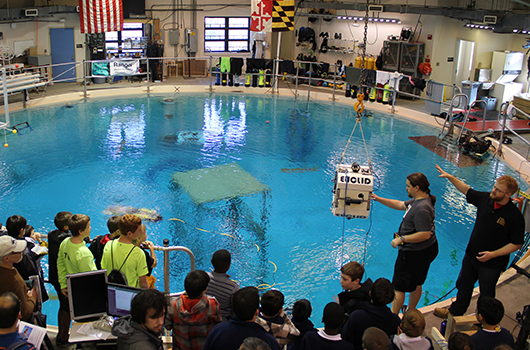 Aerospace engineering graduate students demonstrate robots in the Neutral Buoyancy Research Facility during Maryland Robotics Day. The Maryland NanoCenter's AIM Lab features state-of-the-art Tescan GAIA and XEIA FIB/SEM systems, and is dedicated to the characterization of the structure and composition of a broad spectrum of hard and soft materials and biological systems with nanometer resolution. The Bioprocess Scale-Up Facility is a laboratory dedicated to the development and scale-up of fermentation biotechnology products and processes. The Glenn L. Martin Wind Tunnel (GLMWT) is a state-of-the-art facility used in aerodynamic research and development. GLMWT supports experiments and analyses for the design of aircraft, boats, ground vehicles, and structures exposed to wind and hydrodynamic forces. The Rolf Jensen & Associates Fire Science Laboratory includes the capabilities to conduct cutting-edge research on fire behavior and fire protection products. The MakerBot Innovation Center is a centralized, scalable 3D printing space that empowers students, faculty, and staff to invent, innovate, iterate, and replicate. The Micro and Nano Fabrication Laboratory, or FabLab, is a class 1000 research cleanroom covering a total area of approximately 10,000 square feet. The lab supports research and development programs in nano science and technology, micro-electromechanical systems, semiconductors, materials, and devices for electronics, bioscience and bioengineering, and sensor/actuator systems. The Neutral Buoyancy Research Facility, which simulates the weightless conditions of space, is the only facility of its kind on a university campus. It is one of four on-campus research facilities associated with the University of Maryland's Space Systems Laboratory. The Radiation Facilities include the Maryland University Training Reactor, a dry cell gamma vault irradiator, and a 10 MeV electron linear accelerator that supports teaching, research, and service for the university and outside collaborators. The Robotics Realization Laboratory (RRL), housed in the Maryland Robotics Center, is a student-centered space that focuses on designing, building, and testing novel robot designs. RRL supports faculty and students by providing the most advanced human-safe robots, including humanoid robots such as Baxter, for manufacturing and medical applications as well as mechanical and electrical rapid prototyping equipment to support the development of robot hardware not commercially available. The Tissue Engineering and Biomaterials Laboratory uses the principles of both engineering and life sciences to develop biomaterials that improve the quality of life of ill or injured patients. The Unmanned Aircraft Systems (UAS) Test Site stands at the forefront of UAS rulemaking, commercialization, and national airspace integration. Test site experts leverage their decades of experience in military and civilian aviation, engineering, and project management to accelerate the safe, responsible application of UAS in public and private industries.